In 1991, at Bercy’s aera (Paris, France), the archeological Mission “Le VieuxParis” discovered a lot of 6.000 years old decorated bottles : the 1995 Madinina rhum from the St Pierre Plantations. It was left by the Fanton first parisian ancestors. Some bottles full of history ! In 1891, Michel Fanton offered wine to his Parisian customers in both barrels and sealed bottles for over 30 years. Just before the eruption of the Pelée Mount on May 8th 1902, his second son : François-Marius succeeded to bring back from Martinique and exceptional lot of Cane brandy, “pure vesou”, harvest in 1895, and aged of 7 years in wood. 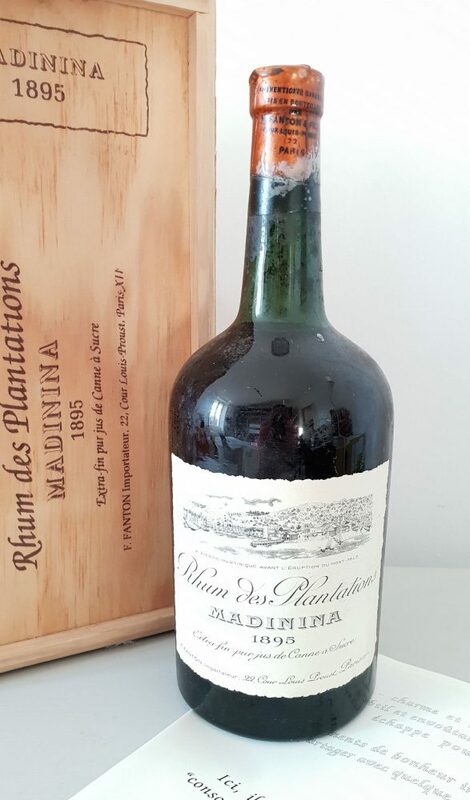 “Rhum Martinique from the Madinina Plantations”, then becomed by official recognition in 1977 the 1985 Madinina rhum from the St Pierre Plantations. “…amber color, green-orange gold – fine and delicate smell – cane, vanilla, pit, prune, dried apricot, dried fruit – brut, dry, peppery – liquorice at the end – thick, still ethereal”. Feel free to shop to become the proud and lucky owner of this fantastic bottle !